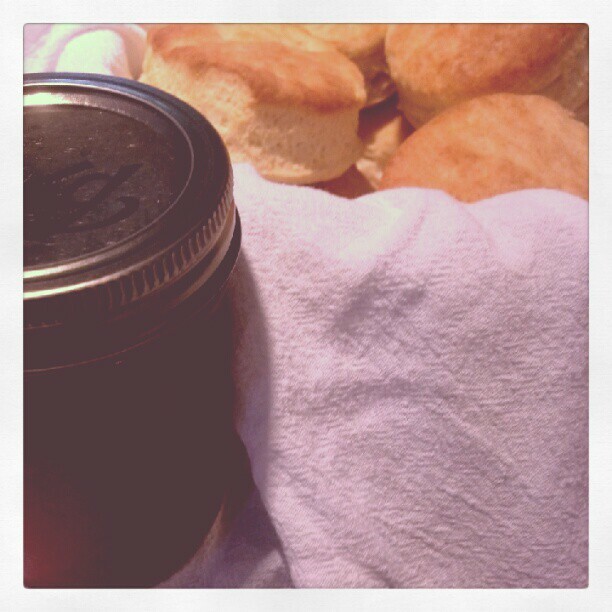 Biscuits are so easy, unless I'm camping I doubt I'll ever buy canned biscuits again. Just 3 ingredients on a Sunday morning and you can have homemade fluffy biscuits to slather with butter and homemade jam. Measure flour into a large bowl. Pour in milk/buttermilk and stir with a fork until the dough just pulls away from the side of the bowl. Gather the dough with your hands, then turn out onto lightly floured surface. Knead 2-3 times, until it just comes together. Pat out to 1/2 inch thick and cut with a 2" biscuit cutter dipped in flour (or a glass or cookie cutter or canning jar lid, whatever you have on hand.) You will have 9 plus scraps, I usually lightly twirl the scraps together and use them for sampling when the biscuits are done. Grease and flour or spray a baking sheet 8"x8" or larger. Place biscuits in sheet, for softer biscuits place them right next to each other, for crispier edges place them farther apart. Brush tops with melted butter fresh out of the oven.